Devotees of a dead guru in India have told the BBC they put his body in a freezer to preserve him as they believe he will return to life to lead them. Ashutosh Maharaj was declared dead by authorities in Punjab on 29 January after a suspected heart attack. But, confident that he was merely in a state of deep meditation, his followers froze his corpse. He led the Divya Jyoti Jagrati Sansthan (Divine Light Awakening Mission) which claims more than 30 million followers. "He is not dead. Medical science does not understand things like yogic science. We will wait and watch. 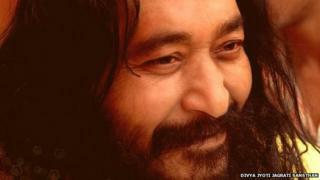 We are confident that he will come back," his spokesman Swami Vishalanand told the BBC. He said that although doctors had declared Maharaj "clinically dead", he was actually alive and in a state of samadhi, which is the highest plane of meditation. The guru is thought to have been in his seventies. Swami Vishalanand said the guru had "often indicated that he would not be with for us a long time, and we would have to manage the organisation in his absence". He said after the doctors declared him dead, his devotees watched over the body for a week at the centre in Punjab's Jalandhar city. "The body did not decompose before we put it in the freezer. It was a spiritual experience. We thought of embalming it, but somebody told us that his chances of revival were less if we did it," Swami Vishalanand said. "He has assured us that he will come back," another devotee, Lakhwinder Singh, told the Indian Express newspaper. The decision to place the body in the freezer was challenged in court by a man, claiming to be a former driver of the guru, who alleged that his devotees were not releasing the body because they wanted a share of the guru's properties. "The court rejected his pleas after the Punjab government said that the man is clinically dead and that it is up to his followers to decide what they want to do with the body," Punjab legal official Reeta Kohli told the AFP news agency. Senior police official Gurinder Singh Dhillon said police "cannot interfere" now that the court had made its ruling. The website of the Divya Jyoti Jagrati Sansthan says it was established in 1983 and aims to "achieve world peace". It claims to have 350 branches in 15 countries. In 1993, the devotees of a Calcutta-based guru Balak Brahmachari refused to cremate his body for nearly two months, insisting that he would recover from a "meditative trance". Eventually, some 450 policemen entered his religious centre on the outskirts of the city and took away his decomposing body for cremation in the face of fierce protests by the devotees.